New scalable, intensified, lower carbon approaches to hydrogen production from bio-fuel and conventional fuel conversion and better utilisation of low carbon electricity resources are needed to give flexibility of response in accommodating future increases in demand and allow the transition toward a more distributed production system. Combined reaction and separation will lead to smaller less capital intensive equipment that will be easier to operate. This Work Package investigates chemical looping (as illustrated in the figure below) for the production of hydrogen by the reforming of fuels such as natural gas and biogas. By using an appropriate oxygen carrier (such as a metal/metal oxide pair) a chemical looping process temporally separates the oxidation and reduction products taking place during e.g. methane reforming. Research has identified chemical looping materials that are much more stable than existing materials for hydrogen production. A patent application has recently been published. Chemical looping process for autothermal methane reforming with hydrogen production. 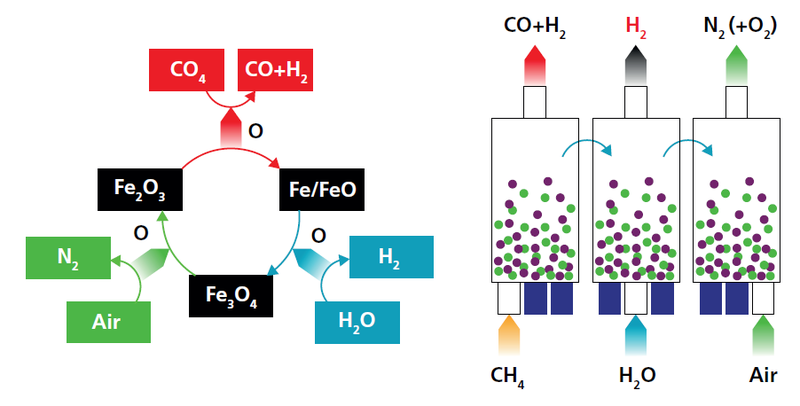 An iron oxide carrier is reduced by methane to produce reformate. The carrier is then oxidised with water to produce hydrogen and further oxidised by air to complete the cycle. The project aims to develop a novel plasma-catalytic process for biogas reforming at low temperatures that can deliver affordable, sustainable and clean hydrogen. The study is seeking to design a fully integrated biohydrogen production process using fermentation and bioelectrolysis. To date, it has shown for the first time that hydrogen yield and volatile fatty acids (VFA) in a continuous biohydrogen fermenter can be increased by using in situ electrochemical hydrogen separation, CO2 removal and VFA separation via electrodialysis. Results of the project have been presented at the APEC Biohydrogen conference in Malaka, Malaysia Dec 2014 and at the 72nd IEA-HIA ExCo meeting, Netherlands 2015.